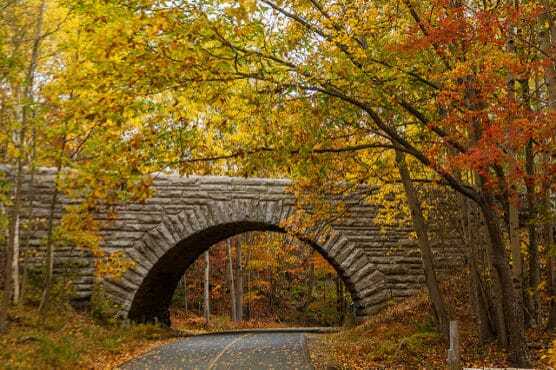 Set for its 42nd annual running through Maine’s Acadia National Park, whose 47,000 acres encompass most of the island on which it sits, this race is the only one of its kind that actually runs through the grounds of a U.S. national park, and takes place at a time when the autumn leaves are turning brilliant shades of orange, red and gold. You’ll find out what they mean when you travel here, as it’s filled with hills and mountains, perhaps none better known than Cadillac Mountain in the center of the island. That’s just part of the scenery you’ll find at the race, which follows an out-and-back course that starts and finishes in Bar Harbor next to the Mount Desert Island YMCA on Park Street. While the half marathon will start on Main Street and continue north from there, the finish line lies in the athletic fields across Park Street from the Y. From the starting line downtown, runners will head north along Main Street and turn left on West Street, where they’ll begin making their way toward Acadia. There’s one last turn on Duck Brook Road before they enter the park, and then begin running some 9 miles along its carriage roads. The philanthropist John D. Rockefeller built some 45 miles of these carriage roads through Acadia between 1913 and 1940, and through the past century they’ve offered a way for “city-folk” to escape the urban jungle to get away to the park’s seashores, forests and lakes, and today are filled with walkers, hikers, bicycles and horse-drawn carriages — but no cars. The race goes west and then turns south on the carriage roads to take runners nearly all the way around the park’s largest lake, called Eagle Lake, a stretch that also features the biggest uphill of the race, a 180-ft. climb between miles 6 and 7. 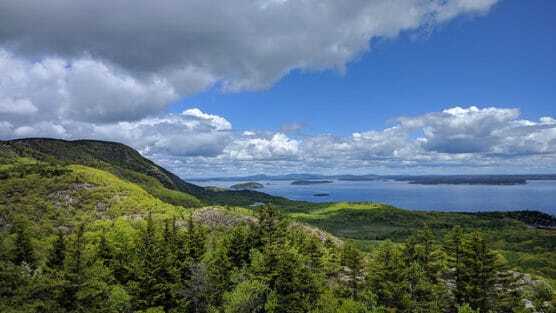 Know that you’ll be running through history when you run through Acadia, as Mount Desert Island was first visited by Europeans in 1604, when a Frenchman named Samuel Champlain led an expedition here. After the mile 7 peak, the race heads downhill again and then along the eastern shore of Eagle Lake, which offers up some of the most beautiful scenery of the route. Once you make it to the top of the lake, between miles 10 and 11 you head off the carriage roads and back onto Eagle Lake Road, which takes you out of the park and back into Bar Harbor for the race finish. Make sure to register early — due to the fact that such a big stretch of the race route is located inside Acadia National Park, the half marathon is limited to 400 participants. That means you’ll have plenty of “elbow room” when you’re out on the course, organizers say. Nestled along the eastern coast of Mount Desert Island in southern Maine, Bar Harbor typically sees some of its mildest weather of the year in September, which brings average temperatures between the upper 40s and the upper 60s, and rainfall amounts just over 4 inches, making it the 4th-driest month of the year. See the race route map for the Bar Harbor Bank & Trust Half Marathon here. To reserve your spot in the 2019 running of the Bar Harbor Bank & Trust Half Marathon or Fall 5K race, register online at RunSignUp.com here. Ever run in the Bar Harbor Bank & Trust Half Marathon? Share your impressions here, as well as anything you learned about the race that you think other runners/walkers should know.